Why has using the computer mouse become a problem? What makes using a computer mouse hazardous? What can be done to reduce the risk of injury from using a computer mouse? The Inquiries Service at CCOHS answers questions on the health or safety concerns people have about the work they do. The mouse is a common piece of computer equipment which helps people use computers more quickly and easily. Since the introduction of Windows technology in the 1990s, which made mouse-intensive software popular, the mouse has become standard office equipment. Using a mouse as the only input device (as with a computer game) is not hazardous as long as the computer workstation is set up properly and frequent breaks are observed. However, because most people using a mouse in a workplace setting must use the computer keyboard at the same time, using a mouse regularly works the same small muscles over and over again, and can lead to discomfort, pain, and even Workplace Musculoskeletal Disorders (WMSDs). The second reason using a computer mouse can be hazardous is that the placement of the mouse can make it awkward to reach. 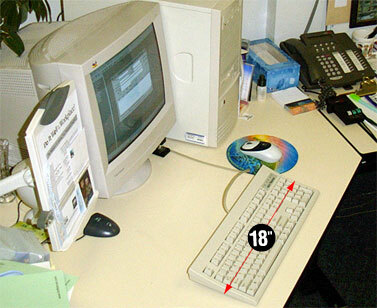 Many computer workstations have limited space; since the keyboard is already directly in front of the person using the computer, most times the mouse is placed around the upper right hand corner of the keyboard and toward the back of the desk (Figure 2). When the mouse is in this position (Figure 2), it is out of 'easy reach': it is beyond the safe distance range for comfortable hand movements. 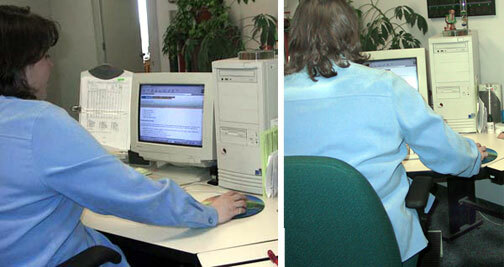 In order to use the mouse, the person has to reach their arm outwards and forwards (Figure 3) and hold it there unsupported for as long as they are using the mouse. Moving like this, and holding your arm like this, again and again throughout the workday can cause soreness and fatique by putting an extra load on the muscles in the upper back (Trapezius muscle) and shoulder (Deltoid muscle). 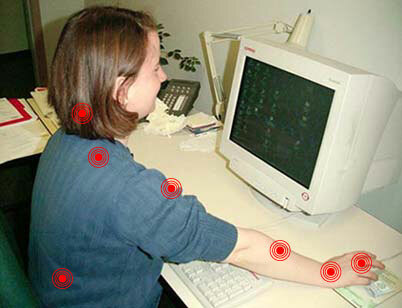 Repeated use of the mouse, therefore, can cause aches and pains in the shoulder and neck area. Lower back pain, while not directly caused by the mouse, can also be a problem if the computer user has poor posture and leans forward when they sit. Designing a computer workstation which lets a person use a keyboard and a mouse (or other input devices like trackballs or graphics tablets) at the same time can be very difficult. The complete elimination of aches, pains, and WMSD may not be possible, but choosing the right mouse, positioning it properly, and being aware of how you are holding your body and using your muscles can all help. For information on how to reduce discomfort and pain, and how that makes iit less likely that you will get injured, please refer to the OSH Answers documents, "Computer Mouse - Selection and Use" and "Computer Mouse - Location - Beside Keyboard". OSH Answers Search is designed to help you specifically target items about Occupational Health and Safety that are explained in the OSH Answers portion of our site.